After you get past second-guessing yourself and questioning whether this family reunion will be fun or agonizing, you start to wonder how to prepare for large family events. In most cases, booze is necessary—either to put grandma or you in a good mood or even just to get through the whole weekend with your crazy but loveable family. 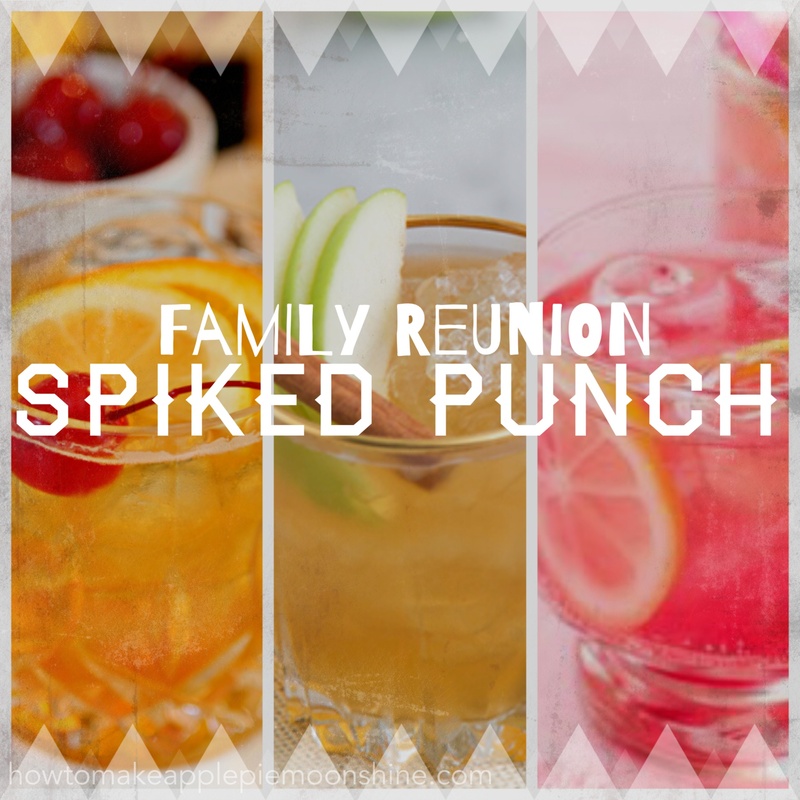 Spiking your party with these adult drink suggestions will definitely help make it a fun and enjoyable gathering for those who are over 21. One can always go about beverage selection at one’s reunion in a number of ways: open bar, mini bar, or just bringing the essentials. This is all dependent upon the party budget and family member involvement. With an open bar, you can assume that there will be a pretty hefty tab to pay at the end of the night or weekend—especially if it is a full or an all-inclusive bar. You can opt for a half bar, which includes a limited selection at a lower cost, but it can still add up. One can choose to do a cash bar, whether full or half, so that there is more of an individual responsibility for beverage purchases. Then, of course, the cheapest option is instating Bring Your Own Booze, or “BYOB.” This means having the family chip in on all of the supplies or having everyone bring their favorites with enough to share. No matter what you choose, preparing for a large party can be a pain in the rear end. We hope that we can help out with these tips and tricks, which we have compiled to make sure your large party goes as smoothly as possible. In preparation, expect adults to drink at least 2–3 drinks each. A great way to cut costs is to have mixer jugs or kegs as well as other communal drink options. Assuming that there are many young kids or folks who choose not to drink, it is important to recognize that additional soft drinks and water will also be needed. Putting these in a couple of coolers positioned in various places around the party will keep everyone happy. From personal experience, my family typically opts for the BYOB option, and honestly, it works like a charm every time. With my family’s deep Wisconsin roots and large family gatherings there is often lots of beer and plenty of old fashioneds. When everyone brings his or her own beer, we usually end up with a wide variety of flavors and types. Beer is easy; with the mixed drinks, we like to spike our parties up a bit. People chip in on supplies, and we begin to make our mixed drink jugs. Making mixed drinks on large scale is a great way to help save time, money, and space. Fill a large, coverable serving jug about ¼ full of ice. Add 750 mL of whiskey. Add 3 L of 7 Up or Squirt. Add 50 mL of old fashioned mix. Add 2 Tbsp of olive juice. (If using bitters, lightly sprinkle a few drops into the mixture). Serve in cups, and leave a cooler of additional ice on the side. Leave the garnishing plate for guests to simply pick up and pop in a couple of olives. This a family favorite, and I promise that you will not be disappointed. For those with a sweet tooth, give the drink a squeeze or two of the orange wedges, and drop a few muddled cherries to the bottom to really highlight the flavors. Add cans of frozen concentrate to a large coverable jug. Add 4 c of cranberry juice. Add ¼ cup fine sugar. Let it sit in the refrigerator for 1–2 hours. When it’s ready to serve, add soda, lemons, oranges, and ice. Serve with cups and additional ice. A refreshing and spin on our Apple Pie Moonshine. Add moonshine, ginger ale, apple juice, white grape juice, lemonade, green apples, and ice to a large pitcher or jug. Serve in cups with additional ice and apple garnishes on the side. Family reunions always end in a lot of cherisable memories, pictures, and a giant sigh of relief that there is a whole year between now and the next year’s reunion. These various jugs do pack a swift punch, so please drink responsibly, and keep an eye or two out for those young ones—just to make sure they aren’t sippin’ the wrong juice. Happy reunion, everybody!